Note this guide is currently a little linux/osx specific - Only bash shell and ruby sample code is shown. Windows example code will be added. Please contribute and give feedback. This guide shows various ways of making a simple Larson Scanner with phatIO - a row of lights that scan back and forth, named after Glen A. Larsen creator of Knight Rider which features a scanner on the front of KITT. The code is in the repository and linked to from the resources sidebar. The examples start with example shell and ruby code you can run on your host computer, with a self contained - free running - version at the end. We’ll be using Light Emitting Diodes, connected to phatIO’s IO pins. 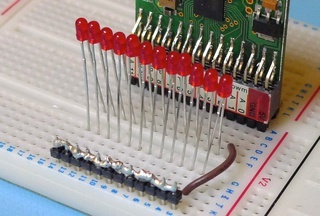 Make sure the LEDs are biased correctly using an appropriate series resistor for your LED. The examples below are on a breadboard and use red 3mm, 5V, 10mA, LEDS connected to pins 0 through 11, but you can extend to use all available IO pins as long as maximum current is not exceeded. 12 5V LEDs with Anodes (Long Leg) connected to phatIO’s top IO pins 0..11 and Cathodes (short leg) connected to ground. Make sure your LEDs are biased correctly. The following contains lots of Operating System and language specific code - see the Host Computer page for general information about using phatIO with your operating system. The *nix shell and ruby code runs on your host computer (the Mac/PC/linux box your phatIO is connected to). The run.lio code should be copied to the “PHATIO/io/run.lio” location on your phatIO device. The simple scanning is something that the phatIO config language can do onboard, here’s an example run.lio (copy to “PHATIO/io/run.lio”) that does the simple digital scanning. Note that there’s no sleep calls available - the code is scheduled to execute every 20 milliseconds, it turns the current pin off, checks if we’re at the end of the row of LEDS and changes direction (sets the increment value to 1 or –1 accordingly) and then turns on the new LED. Here’s a video (after 10 seconds I save the run.lio file with a 50ms delay between each LED change and then reduce it down to 1ms where the scan can no longer be seen. Any questions and suggests please discuss in the forum.